Viking River Cruises operates the world's largest and leading fleet of deluxe vessels built specifically for river travel. With its growing fleet plying the waterways of Europe, Russia, Ukraine and China, Viking has welcomed more than half a million people on magical, enlightening journeys through these exciting places. Following their first river cruise, each guest is enrolled into the Explorer Society - a highly regarded past-guest programme, operated and managed in-house. Viking River Cruises wanted to further develop their relationship with each of their recent passengers, whilst simultaneously enhancing their past guests' experience of the Explorer Society. 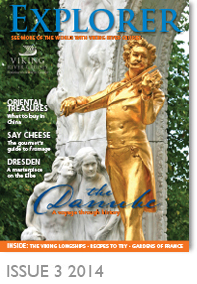 REM Productions were able to provide a complete solution: from the initial concept, through to design and final production, we have delivered "EXPLORER" - a very high-quality, entirely bespoke publication, exclusively for the benefit of Viking River Cruises' Explorer Society members.